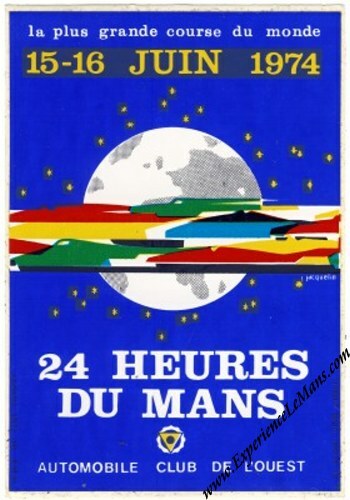 Vintage Original 1974 24 Hours of Le Mans Decal. Original car sticker for the 1974 running of the 24 Heures du Mans. The design of the 1974 sticker follows that of the poster for the main event. 9 x 13 cm / 3.5 x 5 inches. The race was won by Henri Pescarolo & Gerard Larousse in their # 7 Matra-Simca MS670C (S/N B-06) with a total of 338 laps to their name. For the full results of this race, please see 24 Heures du Mans results 1974.